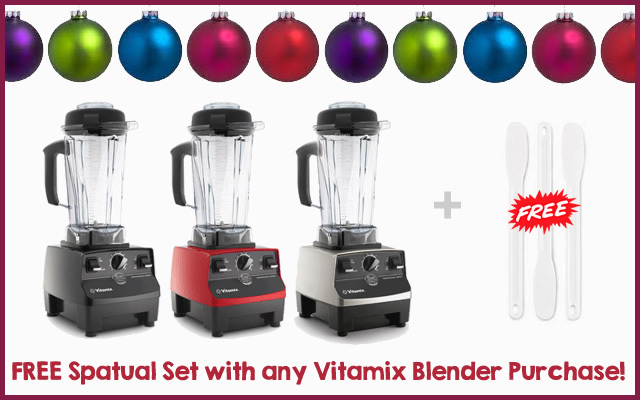 Until the end of December, Vitamix is offering my readers who purchase any Vitamix Blender a FREE gift PLUS FREE Shipping! Thanks Vitamix! You will receive a FREE set of 3 Vitamix Spatulas – which are thin & perfect for scraping down the sides of your container so you don’t miss a lick of that homemade hummus! You will also receive FREE shipping (a $25 Value) on your order. Please note: The spatulas will ship separately from your Vitamix order within 30 days & will not show up on your invoice. The Vitamix makes an amazing gift & comes with everything you need to start your journey to better health & eating. My personal favorite Model is the ‘C’ Series. I have the 5200 Model in Black & White (yes, I have two!). However, the new ‘G’ series offers the same size container, but with a design that fits perfectly on your counter under your cabinets. The ‘S’ series is perfect for smaller serving sizes & blending on the go. Don’t forget that Vitamix also offers Reconditioned Machines for a deep discount that offers the same amazing warranty as their New Blender. If you need more help deciding which model is best for your family, you can visit Vitamix’s comparison page. « Score a KitchenAid 5qt Mixer for around $109!